Plants live in climate zones suitable for their physiological adaptations, and live in vegetation types in distinct bands or zones. Rainfall increases with elevation while temperature decreases. 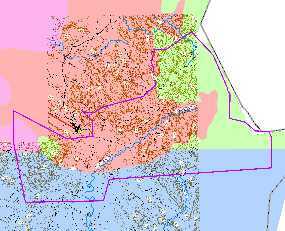 General zonation patterns are easily seen with desertscrub and tropical communities in lower, hotter, drier areas, and temperate grassland, chaparral, and woodlands and forests in higher, colder, wetter areas. 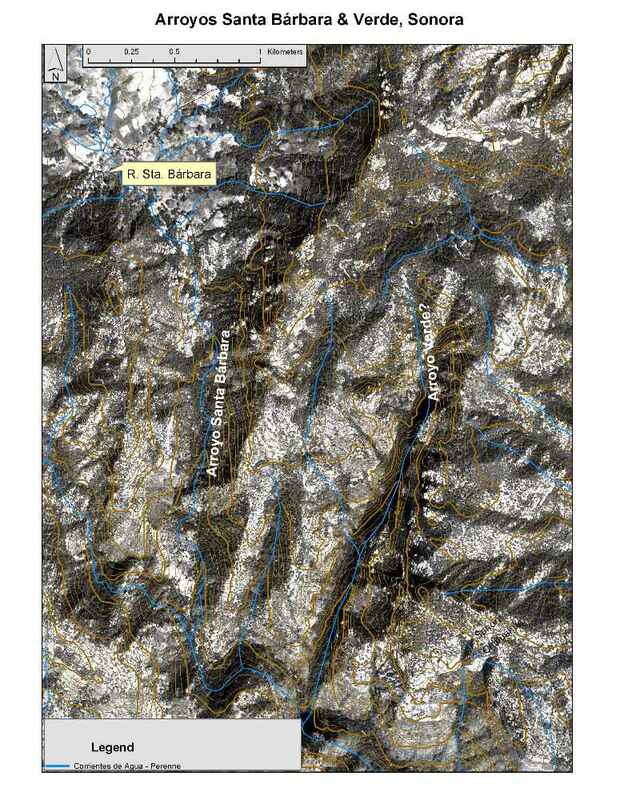 However, the elevational limits of vegetation zones are only general, and are strongly influenced by complex topography, and less so by unusual geologic substrates. In southern Sonora major elevation-related changes in vegetation are easily seen from the Gulf of California inland to Alamos and up into the Sierra Madre Occidental (this chapter), and along MEX 16 from northwest of Tepoca to the Chihuahua border (Friedman 1996, Martin et al. 1998, Van Devender et al. 2002, Van Devender et al. 2005). 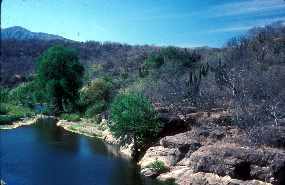 At the latitude of Yécora a west to east transect of Sonora goes from Sonoran Desert on the coastal plain to pine-oak forest near the Chihuahuan border. The Sonoran Desert ends just south of Guaymas, so a transect at the latitude of Alamos does not cross the desert biome. 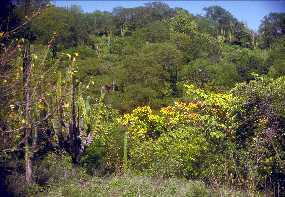 Vegetation of southern Sonora, Mexico. 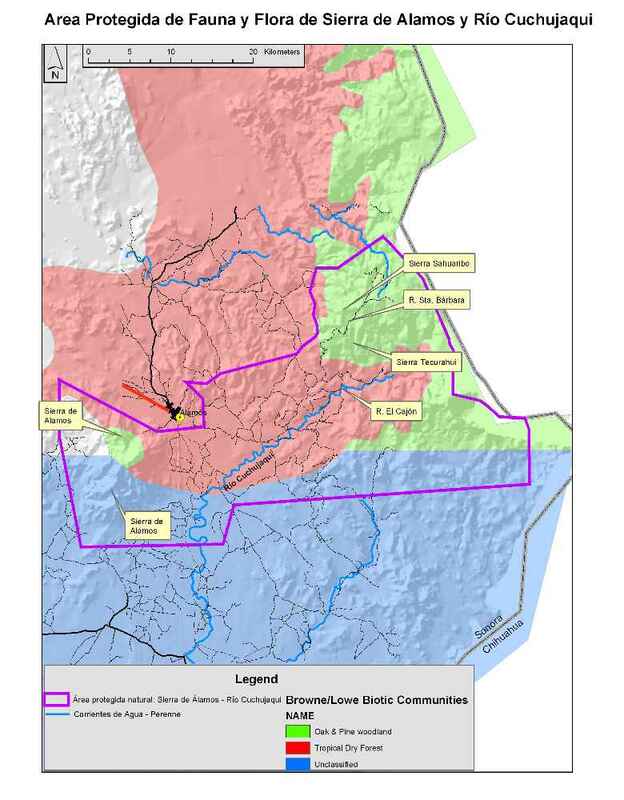 Researchers are refining this region of the Brown, Lowe, and Pase (1979) map..
Satellite image of El Cajón-Santa Bárbara region northeast of Alamos.Click on map for a larger version. 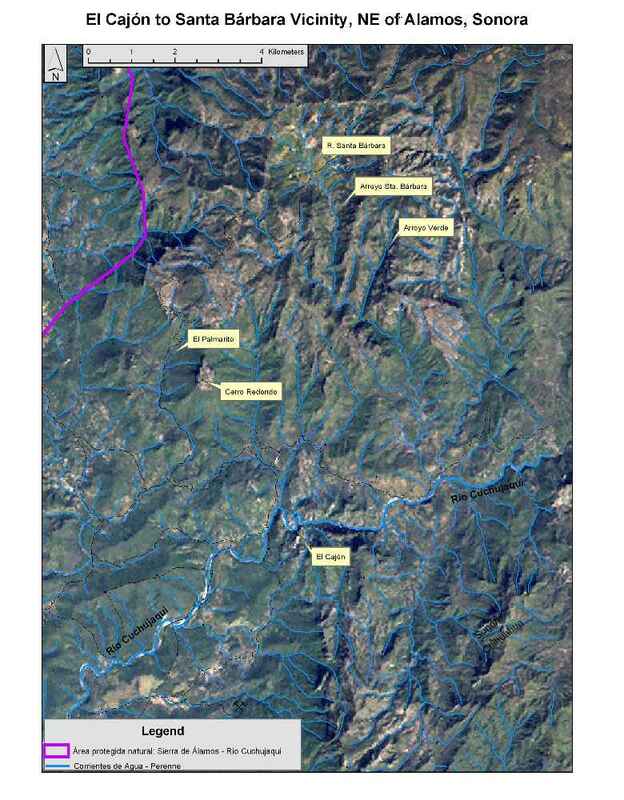 Click here for a closer zoom of the Santa Bárbara vicinity. Mangrove swamps (manglares) occupy sheltered bays along the coast. Coastal thornscrub covers the coastal plain while foothills thornscrub (matorral espinoso) occurs on rocky slopes up to about 650-985 ft (200-300 m) elevation along the Río Cuchujaqui southeast of Alamos. An isolated patch of thornscrub occurs at 1,510-1,800 ft (460-550 m) in the rain-shadow valley at Curea. 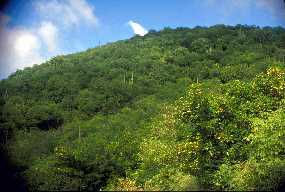 Tropical deciduous forest (selva baja caducifolia, TDF) is found in a broad band at 650-3,800 ft (200-1,160 m). 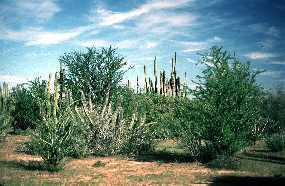 The easiest way to distinguish thornscrub from tropical deciduous forest is that in thornscrub the columnar cacti tend to be taller than the trees. 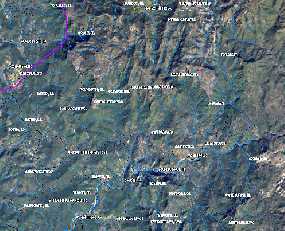 Oak woodland (bosque de encino) occurs at 3,280-5,575 ft (1,000-1,700 m), down to 2,950 ft (900 m) in canyons. The transition between these two vegetation types is blurred because Chihuahua oak (Quercus chihuahuensis) and encino roble (Q. tuberculata) occur as low as 1,150 ft (350 m) in TDF east of Alamos. The Brown and Lowe community named Madrean Evergreen Woodland is now divided into Oak Woodland and Pine-Oak Forest. 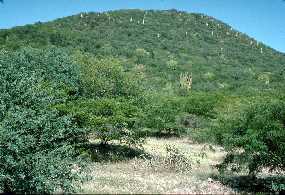 Pine-oak forest (bosque de pino-encino) occurs at 3,940-5,775 ft (1,200-1760 m), to 7350 ft (2,240 m) in Chihuahua), often in a mosaic with oak woodland. 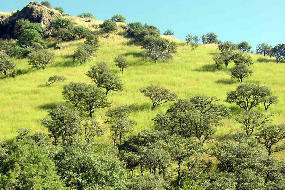 Grassland (pastiza) occurs in high valleys at 3,940-5,575 (1,200-1,700 m) surrounded by oak woodland or pine-oak forest. Mixed-conifer forest (bosque de coníferas mixtas) with Durango fir (pinabete duranguense , Abies durangenis) at 6,230-6,890 ft (1,900-2,100 m) in Barranca El Salto on the west side of Mesa del Campanero above Yécora is the only eastern Sonora example of the vegetation type. Plant distributions on gossans (areas with hydrothermally-altered, acidic volcanic soils) are often unusual, and not typical of normal vegetation zonations (Goldberg 1982). A few cusi oaks (Quercus albocincta) grow at 720 ft ( 220 m) at Cerros Verde north of Alamos. 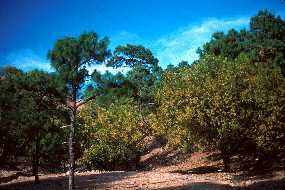 At Agua Amarilla near Tepoca, a pine-oak forest with Yécora pine (Pinus yecorensis) and cusi at 2,950 ft (900 m) is surrounded by TDF, as is eggcone pine/ pino chino (P. oocarpa) on a series of gossans at 2,690-3,610 ft (820-1,100 m) near Santa Ana. 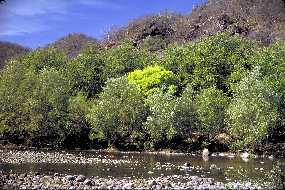 Riparian communities are not biomes, but linear biotic communities that occur within any biome. Another discussion of vegetation zones is included in the orchids of Sonora manuscript. See the flora section for images and information on individual plant species.